egy kellemes, színes utazáson keresztül. 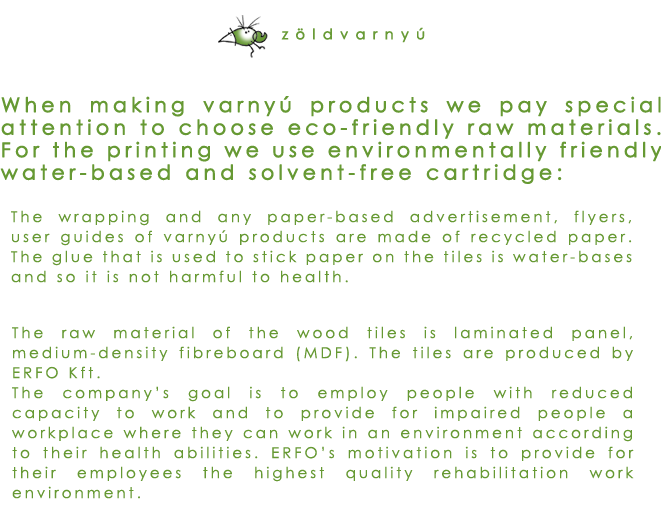 The wrapping and any paper-based advertisement, flyers, user guides of varnyú products are made of recycled paper. The glue that is used to stick paper on the tiles is water-bases and so it is not harmful to health. The raw material of the wood tiles is laminated panel, medium-density fibreboard (MDF). The tiles are produced by ERFO Kft. The company’s goal is to employ people with reduced capacity to work and to provide for impaired people a workplace where they can work in an environment according to their health abilities. ERFO’s motivation is to provide for their employees the highest quality rehabilitation work environment.